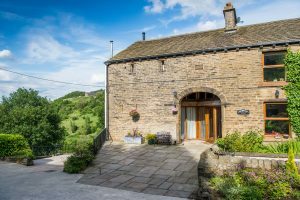 Holiday Barn Yorkshire | Crabtree Holiday Barn is a beautifully converted 19th Century building in Scammonden West Yorkshire. This luxurious, self catering Yorkshire holiday barn overlooks stunning countryside with wild deer, badgers, kestrels and woodpeckers. Crabtree Holiday Barn West Yorkshire is close to Halifax & Huddersfield and only 30 minutes from Manchester and Leeds. If you are searching for a Self Catering Holiday Barn West Yorkshire call Crabtree Holiday Barn Yorkshire today. Self Catering Holiday Barn Calderdale. Set in the beautiful countryside of the South Pennines, this converted barn has an extremely spacious open plan living area with Jotul wood burning stove, lounge area, flat screen TV with FreeSat and DVD, dining area (seating 6) and fully equipped kitchen on the first floor with far reaching, panoramic views of the surrounding countryside. The kitchen has an electric hob, grill and oven plus a separate microwave. There is a full size dishwasher and a spacious fridge freezer. Downstairs there are 2 bedrooms, one with kingsize bed (en suite with shower bath and grohe shower over), and one twin bed / or 6ft super king bed (ensuite with spacious shower). We can also accommodate one child under 2 years old in our wooden cot in the super king bedroom (please bring your own bedding for cot except for flat sheet). Fluffy towels are provided. Central heating (eco friendly pellet boiler) and your first basket of logs are included. Crabtree Barn is child friendly with a proper wooden cot, highchair, baby bath, safety plugs, changing mat and safety gate plus toys for the younger ones. We offer free Wifi (but please be aware we are in a country location and this is not super speed wifi!). In the “underdwelling” (basement but with windows) a further room 30 square metre room contains a full size table tennis table, washing machine and separate tumble dryer plus secure indoor storage space for bicycles. Crabtree Barn has a shared garden and barbecue with its owners. There is parking for a maximum of 2 cars. This is great country for walking, cycling, birdwatching (near to Marsden Moor RSPB reserve) or just relaxing! Walking and cycling are straight from the doorstep. We are close to Ripponden, Slaithwaite, Marsden, Huddersfield & Halifax and near to York, Harrogate, Manchester, Bradford and Leeds. Sorry no pets.